This absolutely breathtaking watch is luxurious and indulgent, even for Cartier. The WE104531, of the Tank Francaise line, is made of an 18 Karat Gold Dial, a Diamond encrusted bezel, and a Satin strap. The delicate band and slim, feminine rectangular shape makes it an elegant fit on the wrist of a any beautiful woman. 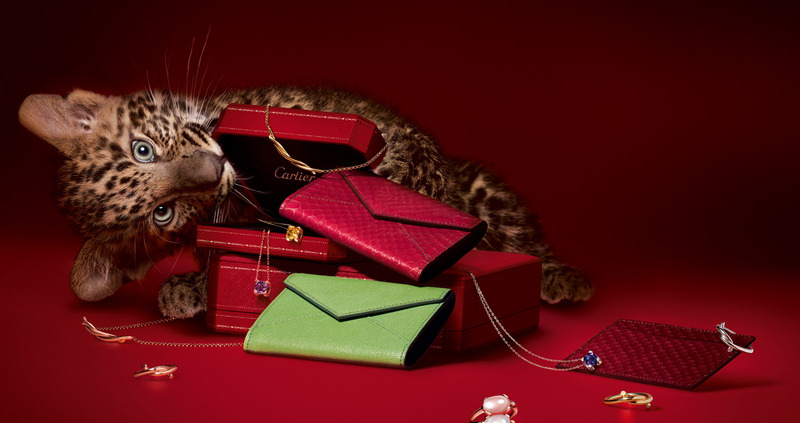 Cartier, known for their luxurious and high end watch designs are also known for their excellent craftsmanship – having created not only the first waterproof watch, but for designing the iconic Deployment Clasp feature that many watches use as fasteners. This watch is no exception. The Tank Francaise line, a more feminine, modern version of their traditional Tank design, is a lovely blend of modern and classic designs. This watch features 12 Roman Numeral Indicators with tiny stick indicators showing the minutes. It has an hour and minute hand, with a Swiss Made Mechanical Quartz Movement. The band is made of delicate Satin, giving the watch a jewelry like feel, which is only accented by the Rose Gold Dial and Diamond Encrusted Bezel. Rose Gold, a copper alloy typically used only for specialty jewelry, makes for a gorgeous dial – and highly polished 18K Rose Gold, as used here, is a stunning, sparkling sign of class and luxury. The bezel is covered in 20 diamonds, 10 on each side, only adding to the watch’s value. This watch, as luxurious as it may be, does most certainly have its downsides. The extremely high value of the timepiece (anywhere from $16,000 to $18,000,) is due primarily to the materials the watch is made out of, and not due to the high quality of the watch itself. While obviously the Cartier name is synonymous with high quality products that will last a lifetime, a satin band is anything but durable – and the diamonds encrusted in the bezel seem almost bound to come out. It seems as though purchasing this watch would be wise only if you know you will be wearing it for fine occasions, as it seems delicate and slightly easy to break. However, all complaints aside, this watch truly is beautiful, and if you are looking for something luxurious and elegant, you will most certainly find it through Cartier’s gorgeous Tank Francaise line.